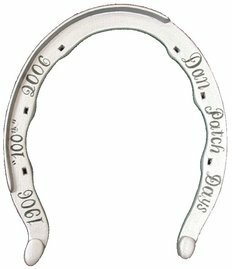 are the 2018 finders of the lost horseshoe, ​found on Friday night. They are 19 year residents who have been active in searching for the horseshoe in past years. More information and a picture are coming soon! Congratulations to the Weisensel family. When the fourth clue in the annual Horseshoe Hunt leading up to Dan Patch Days was revealed, the Weisensel family knew exactly where to go. The Savage family of four had been paying close attention to the clues each week, even refreshing the Dan Patch Historical Society’s website repeatedly, waiting for a new one to be revealed. The family has celebrated Dan Patch Days for the last 19 years, since moving to the city, and always watched the horseshoe hunt and followed the clues from afar. But this year, they decided to have a go at the hunt. Evan Weisensel, 20, hadn’t even finished reading through the fourth clue when he figured out where the horseshoe was hidden: the Savage Dog Park. He said the word “Yorkshire” in the fourth clue gave it away, as a Yorkshire terrier is a small breed dog. Evan and his sister, Christina, 24, were out running errands ahead of Father’s Day when the fourth clue was revealed. They got in touch with their dad, Nick, who rushed from his home in Savage. They all met at the dog park. Nick Weisensel said the dog park was a “hot spot” that night. Even Rep. Drew Christensen, R-Savage, was there, he said. The trio started looking around for the horseshoe, which was found hanging on a tree limb. Evan Weisensel plucked the horseshoe out of the tree and walked up to his sister. “Pick a hand,” he said. She did and her brother revealed the horseshoe. They freaked out, quietly. The dog park was crawling with other horseshoe hunters. They approached their father and another subtle freak out session took place. When they arrived back home, Evan Weisensel went up to his mother, Laur, and again said “Pick a hand,” eventually revealing the shoe. Laur Weisensel said she knew when her family went out looking for the horseshoe that night they would return with it. a new clue for thee: Glendale Cemetery. Find a presidential plot, then the same on a plat. Christina Weisensel said she looked up the index of those buried at Glendale Cemetery and found someone with the last name of “Nixon,” a presidential name, of course. She then found an old plat map from 1913, which showed where Nixon family land was. She printed out a current map of that area using Google Maps and overlaid it on the 1913 map. She then had a general idea of where the horseshoe was at, she said. “The clues were really good this year,” Christina Weisensel said. The family has always looked forward to Dan Patch Days every year, Laur Weisensel said. The family is absolutely “tickled” to have found the horseshoe and to be involved with the annual citywide celebration a bit more this year, she said. Part of finding the horseshoe involves a $100 reward, which Evan and Christina Weisensel will split, the chance to ride on a float in the Dan Patch Parade on Saturday, June 23 and bragging rights, of course. The annual hunt, which has taken place since 1996, has always been sponsored by the Dan Patch Days Historical Society. The horseshoe is hidden somewhere in the city of Savage, on public property. Dan Patch Days run from June 21-24 this year. For more information visit danpatchdays.org. Fleet limbed Dan was in action, but a shoe was lost in poor traction. Rests the prize of the famed pacers arc. And with a button, the prize, we cheer! Dave & 'Bella they farmed their lot. Decided to buy real estate. On this land the shoe is retired. then the same on a plat. it's where the shoes at. Little Patch he was called & with Dan he was stalled. But Pat was his name, best friend just the same. From Yorkshire he came, not a ferrier but a terrier, of fame. With the shoe you end game & the prize you will claim. A find in the small canid area will give you hysteria. The first line is taken from An Ode to Dan Patch by Horse Lover. ​This was published in The International Stock Food Farm book in the Savage Public Library. The city landmark is Camp Savage. The winner gets to ride in the parade & if they've purchased a button win the cash prize. This refers to Dave & Isabella Nixon, born in England & Scotland respectively who farmed here; as most settlers did. Two of there children remained bachelors and took over the farmstead and purchased land in southern Savage that is now the dog park. The "presidential" Nixon's are interred in Glendale, if you find their names on the 1898 plat (found in many references including in the library) you will have the location of the public spaces which included Camp Savage & the dog park. Little Patch was the Yorkshire Terrier that was Dan's constant companion. He had a calming effect on Dan and many stables had dogs for that purpose. With the term best friend in the clue you should be at the dog park by now! I hope all the poo was cleaned up by owners and none was stepped in! Canid is another word for small dog & directs you there rather than the large dog area. The astute winners this year noted the shoe would be in a tree as I described Dan as fleet limbed, but alas, your beloved clue master has to admit, that was accidental cleverness. Thanks to all who participated in the Horse Shoe Hunt & we hope you had fun trying to decipher the clues and visiting all of Savage's parks & history.